Back injury can be debilitating and costly to business and often occurs when people apply unsafe techniques whilst moving loads as part of their work routine. To minimise the risk of costly absence caused through manual handling injury, this course provides your employees with clear guidance and instruction in the correct methods to assess a situation and move objects in order to protect themselves and others from injury and harm. It is suitable for anyone who carries out tasks involving lifting or moving, and is equally relevant for those supervising manual handling operations so that they can reduce the potential for incidents or accidents. 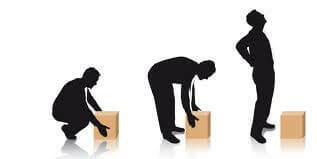 – Be able to apply the basic principles of good manual handling following safe systems at work. – Recognise equipment and its application in supporting good lifting and moving techniques. – Recognise hazards, the potential danger and consequences. – Manual Handling Operations Regulations 1992. – What constitutes ‘manual handling’. – How the human body works in relation to manual handling. – Types of injuries and accident rates. – Applying regulations and best practice. All delegates attending this course shall receive a certificate of attendance.